The causes of knee pain that we often encounter may be caused by injury, degeneration, which is also called osteoarthritis, or the abnormal mechanics of the knee. We can experience pain that affects the knee area because of injuries such as bone fractures and ligament and meniscus tears. Tibia plateau and patella fractures are the most frequent types of fractures and anterior cruciate ligament tears are also frequently experienced injuries. As the fractures generally happen as a result of direct traumas, ligament and meniscus injuries can occur during sports such as football and basketball. It is also known as degenerative arthritis and happens when the articular cartilage gets worn down due to advanced age. 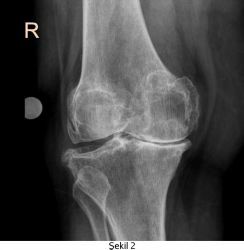 This is the most common kind of arthritis and is frequently observed in the knee. Cartilage traumas, obesity, and overuse may cause degeneration. Joint pain, swelling and a gradual restriction of motion are experienced. Rheumatoid diseases such as rheumatoid arthritis, gout, Behcet's disease and psoriatic arthritis are all immune system diseases that affect the joints along with the other parts of the body. They cause long-term pain, swelling, and difficulty of daily living activities. Overuse or alignment problems may cause strain and injuries in the knee tendons. Sensitivity and swelling occur on the tendons. One of the most frequently encountered types is the patellar tendon. It may be seen especially in runners and people who play sports involving a lot of jumping due to overuse. It can also be seen in the quadriceps and hamstring tendons. 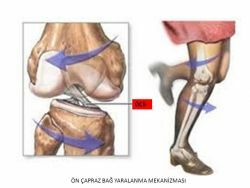 It occurs because of the inflammatory reactions of the bursa sac which serves as a cushion between mobile structures like the muscles, tendons and bones in the knee. Prepatellar bursitis and pes anserinus bursitis are the kinds often seen around the knee. The iliotibial band is a structure that starts from the hip and continues to the outer part of the knee. It may cause pain in the outer part of the knee because of overuse, especially in runners, cyclists and people who do climbing and skiing. The remains of the membrane inside of the knee joint that lingered from the embryo period are called plicas. These plicas may ordinarily be found in the knee. The ones located on the front and inner parts of the knee may cause complaints. They generally cause snapping, locking, and pain in the knee. While standing up and raising the leg straight, the mechanism that keeps the knee working properly links to the tibia via the quadriceps muscle, patella (knee cap), and patellar tendon. There is an epiphyseal plate where this mechanism joins the tibia. Straining this epiphyseal plate may lead to pain, swelling, and predominantly sensitivity to touch, especially after activities such as running and jumping adolescents. The knee joint consists of the femur (thigh), tibia and patella (knee cap) bones. The surfaces of these bones which form the joint are covered by a special tissue called cartilage. Owing to the cartilage surfaces, our joint movements can be performed easily, without pain or friction. 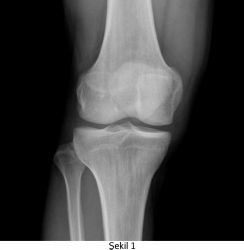 The erosion of the cartilage leads to a disease called arthrosis, which is colloquially known as calcification. While this disorder can be primary, meaning that it develops with age and has no identifiable cause, it can also be secondary, meaning that it is due to rheumatic diseases (rheumatoid arthritis, spondyloarthritis etc. ), previously suffered traumas (fractures, cartilage, ligament and meniscus injuries etc.) or diseases of the synovial tissue which lines the inside of the joint. 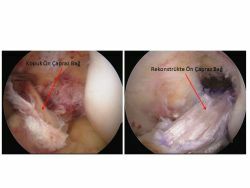 In the advanced stages of knee cartilage erosion, namely gonarthrosis, the patients’ joint movements are rather limited, walking distance decreases and also daily activities are restricted. Intra-articular narrowing, irregularities on the articular surface and joint deformations are observed in the x-rays that have been taken (Figure 1 - 2). When the complaints of the patient cannot be treated with medication and physical therapy, the bones’ articular surfaces with the eroded cartilage need to be replaced with implants called prostheses. This surgical operation is called "arthroplasty" or "joint prosthesis surgery". Especially if the erosion of cartilage affects only certain parts of the joint and if the patient meets certain criterion, then only the eroded part can be changed with a prosthesis and this is called partial (unicondylar) prosthesis application. (Figure - 3). However, since the erosions generally affect more than one area in the joint, most of the patients need a complete (total) prothesis. (Figure - 4). Knee joint prosthesis surgery is generally performed with regional anesthesia (from the waist down). Patients who have had complete (total) knee prosthesis surgery are initiated into knee exercises and walking in the supervision of the physiotherapist on the second day. Usually, during their five-day stay at the hospital, they are provided with training for exercises including walking, sitting down on the toilet, going up and down the stairs. After this period, patients that are discharged from the hospital receive their home exercise programs. After six weeks, they are commonly able to perform daily activities with ease and go out on their own. The patients’ complaints decrease about 90 to 95 percent after the third month. These durations are slightly shorter in the partial (unicondylar) applications. 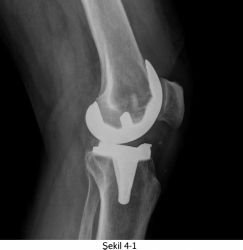 While the durability of the knee prosthesis differs from patient to patient, there are a multitude of parameters that impact its durability. Factors such as bone quality, weight, ligament balance, the way the prosthesis was applied and used, and infections are all important when concerning durability of the knee prosthesis. 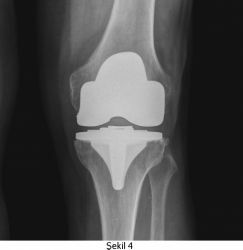 In optimal conditions, a knee prosthesis’ durability is approximately twenty years. The Anterior Cruciate Ligament (ACL) is an important ligament for the biomechanics of the knee that is located inside the knee joint and prevents the tibia from slipping forward or twisting inward. It mostly gets injured due to the knee twisting inward during sports activities. (Figure 1-2-3). Depending on the severity of the injury, ACL injuries can be accompanied by meniscus, cartilage and other ligament injuries. A tearing feeling or hearing a “pop” sound in the knee at the time of injury can be experienced and expressed by the patient. Patients generally cannot continue doing sports activities and they have to consult a doctor with complaints of swelling and pain in the knee following the injury. The complaints of the patients who continue their lives without consulting a doctor are sudden instability in the knee, abnormal knee movements (the knee may feel shaky, or catches, or gives out), inability to control the knee, and a feeling of giving-way. These complaints arise especially during sports or daily activities which require stopping suddenly, or jumping or turning. When the patients who are not treated properly try to exercise, they usually suffer knee injuries over again and, meniscus, cartilage and other ligament injuries may be added to the ACL injury. 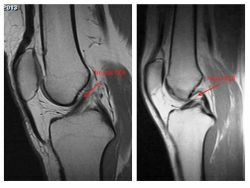 When a person suffers a knee injury, an ACL injury and, if present, other accompanying injuries will be diagnosed through a physical examination and assessment of the findings, x-rays and Magnetic Resonance (MR) images. (Figure 4). After suffering an Anterior Cruciate Ligament injury, in the early stages of their recovery, patients should rest their knee, use crutches to reduce fluid retention, apply cold press and they should also start knee motion and muscle strengthening exercises following the recommendations of their physiotherapists. When they are able to move their knee normally and the swelling has decreased, they can decide the course of the treatment by consulting their doctors. The treatment of Anterior Cruciate Ligament injuries can either be surgical or conservative (non-surgical). The criteria listed below are taken into account while determining the course of the treatment. The expectations of the patient;: For young and active people or people who expect to continue intense physical activity, surgical treatment is the first option. The existence of an accompanying injury: If the meniscus, cartilaginous tissue and other ligaments have been seriously injured along with the ACL, surgical treatment is recommended. Recurring Complaints: For patients whose complaints continue during daily activities after receiving conservative treatment, surgical treatment may be used. The patients who will be treated with conservative (non-surgical) approach need an intense physical therapy and rehabilitation period. The exercise program prepared by their doctors and physiotherapists should be followed strictly for around six months. During this process, the patients’ complaints are monitored. If there is the feeling of instability of the knee or if the knee gives out or feels shaky, or if another injury occurs even after following the proper rehabilitation program, then surgical treatment is recommended. At the present time, surgical treatment employs arthroscopic surgery method and it uses a graft to replace the torn ligament; a new ligament is constructed using the tissues taken from the frontal part of the knee (patellar tendon) or the muscles behind the thighs (Hamstring tendons) and it is placed inside the knee. (Figure 5). Physiotherapy begins 24 hours after the surgery and the patient is allowed to walk with crutches. Crutches are used up to four to six weeks. Exercise programs begin six weeks after the surgery and the patient may start running workouts after 2.5 or 3 months. Patients, who complete their strengthening and coordination programs may be allowed to get back to sports after 6 months. People who work in an office are able to resume working after 20 days while people who work actively may start work after 3 months.